A white lace dress exudes delicateness and a feminine look that will make any lady look alluring. Even though lace is one of the most popular choices for making white wedding dresses, it is also versatile such that you can get a design that fits a cocktail party, prom or any other event. These dresses are available in different shades of white to suit all skin tones. Check out the following white lace dress designs that will steal the show. Short white wedding dresses are now acceptable! However, the trick is to find a dress that is versatile enough to look perfect as a wedding dress yet fits in any other occasions. This sheer A-line dress with floral pattern is ideal for layering, and you can even add a colored belt to create a less bridal look. 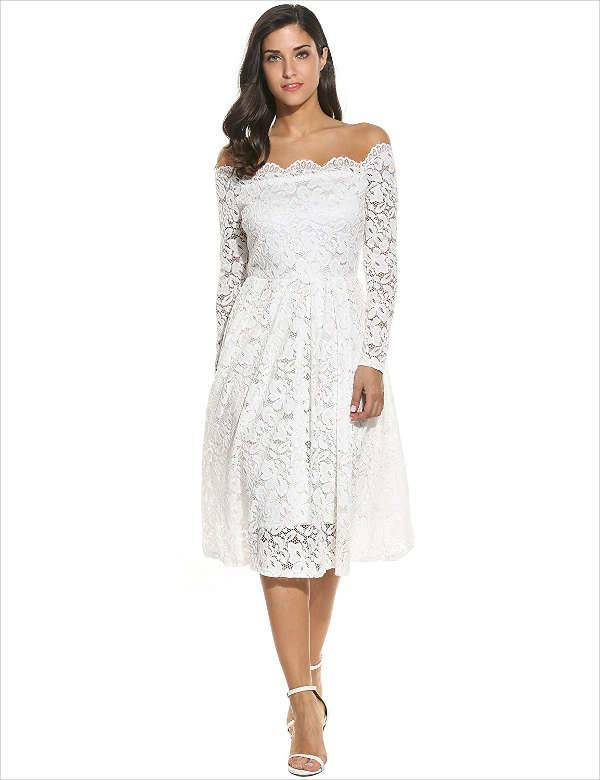 Whether for a wedding, garden party, cocktail, evening party, family gathering, and banquets, off shoulder white long sleeve lace dresses will fit any formal occasion. Designs with underslip features provide enough support for ladies who prefer not to wear a bra. Pair with peep toe pumps or strappy heels. 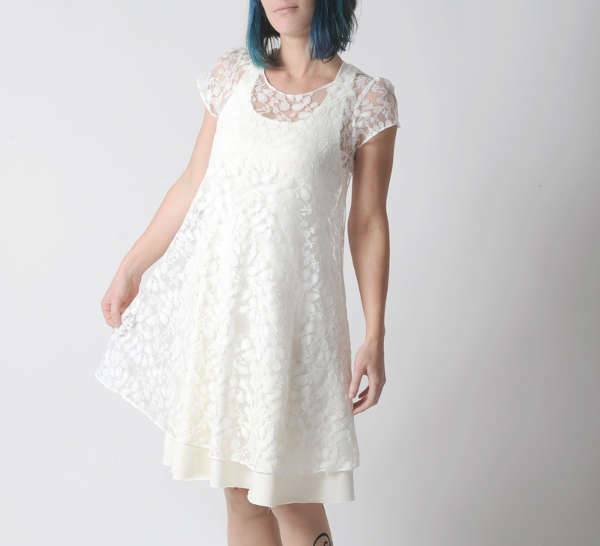 Vintage white lace dresses are ideal for anyone who wants a girly and retro look. The knee length works to camouflage lower body imperfections especially for those who want to cover their legs or need to keep warm during winter. 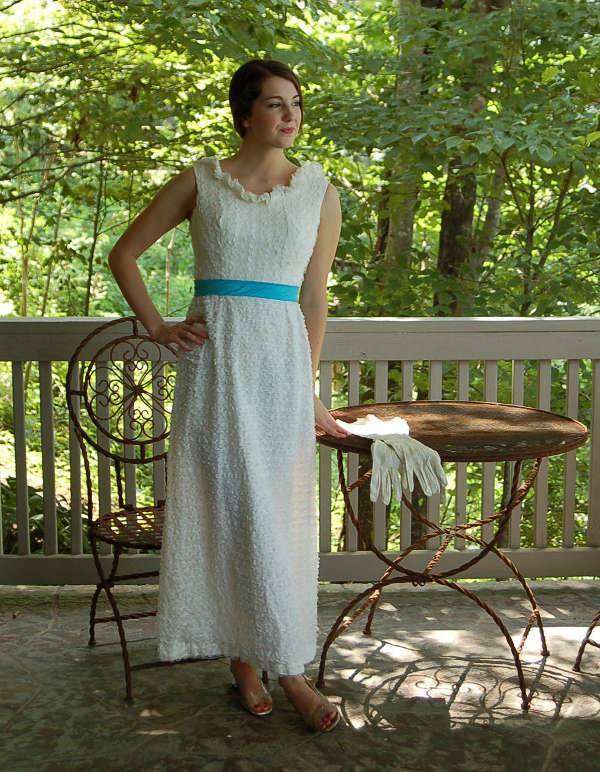 The turquoise band further adds to the aesthetic appeal of the dress. Floor length white lace dresses are the standard bridal wear in most cultures. Depending on the weather and body type, you can opt for a sleeveless dress with a hint of sheer lace at the bottom. These designs are not only modern, but each complements the different body types. Pair with strappy stilettos and a hairstyle that leaves the shoulders visible. White lace prom dresses are becoming trendy especially for girls who want to exude purity and a youthful look. Beaded detailing and a manual sewed Swarovski belt enhances the beauty and quality of the dress. Opt for a slim, flattering cut to ensure you look fresh and elegant at prom. One of the best ways to give a white lace dress a non-bridal look is to pair it with a blazer and designer sunglasses. Off white lace dresses in cream or ivory color have a casual look that makes wearing white dresses fun. Add color by wearing dark leather accessories like boots and a handbag. If you love retro styles then strapless white lace dresses with a vintage 3D embroidered rose, is a must have in your closet. A concealed zipper closure gives a flawless look while the flowy bottom makes the dress comfortable. The cinched waist creates an hourglass figure that will make any woman stand out. It is not easy to pull off a white lace dress without looking bridal. However, when you accessorize it like a professional, you will look stunning. A sheer floral white flowy lace dress looks sweet and gives a carefree attitude. The short design works as a cover up when wearing a bikini or with black tights. White lace wedding dresses have a romantic look that is just hard to ignore. If you want a traditional look, but are afraid you won’t pull off the bright white color then opt for a well-fitting lace dress in ivory, rum white or champagne shade. Lace white dress designs are classy, youthful and fit both formal and casual occasions. They can feature slim cuts that look amazing on brides. Trendy dresses with side and back cutouts prevent the bridal look as well as bold colored accessories and shoes. While lace is the traditional bridal wear, you can still opt for other shades of white that will complement your skin tone.